Following up on last year’s IBM Almaden Institute, I went to visit Paul Rhodes at Evolved Machines. 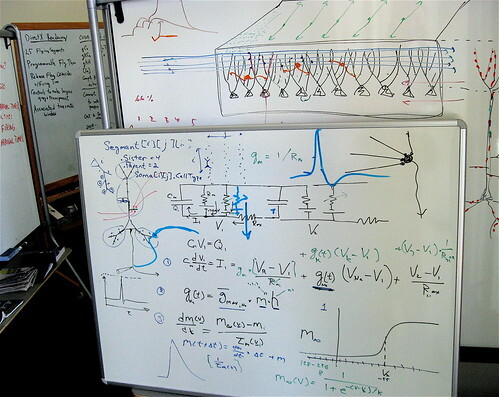 This whiteboard with RC ladders and diff eq’s looked strangely familiar (tickling the EE in this geek). To more accurately model neuronal signaling, the dendrite is broken up into a finite element model of adjacent segments. Somewhat like a coax cable, the dendrite has an inner core of conductive ions surrounded by a lipid layer that insulates the signal from the common ground of the intercellular fluid. In addition to static membrane capacitance and axial resistance, the myriad ion channel pores penetrating the lipid insulator provide rich non-linear dynamics (modeled as a battery and voltage-regulated resistor). Conformal proteins in the channel dynamically regulate sodium and potassium current, with positive feedback accelerating the local rise of voltage above a threshold, and then reversing to rapid negative feedback (creating a classic neuronal voltage spike). The voltage spike will propagate, with gain, along the dendrite, from one finite element region to the neighbor, not as a free flow of electrons, but as a bucket brigade of opening and closing ion channels, like fingers cascading down a very long flute. The dendrite with myriad branches is a fundamental locus of computation, not just the neuron cell body. I am looking forward to Cognitive Computing 2007 at Berkeley. Mental Model, originally uploaded by jurvetson. Dans le concours du meilleur CMS 2007, WordPress est arrivé 1e dans la catégorie “Best Open Source Social Networking Content Management System”. en anglais: A content management system (CMS) is a computer application used to create, edit, manage, search and publish various kinds of digital media and electronic text. pour plus de précision sur l’utilisation de wordpress: codex wordpress, existe aussi en français.